Peeling paint frequently results from not painting right in the first place. Common issues are dirty walls, missing primer, painting when it’s too hot, or repainting with incompatible paint. However, water vapor getting into drywall or siding can lift paint right off the surface! 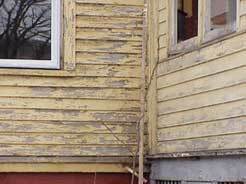 In this blog post we cover laws and axioms of moisture vapor as they pertain to peeling paint. In the second of this two-part blog post, we’ll discuss how the construction of walls leads to peeling paint as it relates to the water vapor laws. Location, Location, Location. When I heard peeling paint inside a house was a something I should be concerned about while evaluating home performance, my first reaction was, “You’ve got to be kidding! I thought peeling paint was a result of not following the directions. What I never really thought about is how moisture flows in a house. Besides figuring out heating and cooling system performance, mastering the laws of water vapor transfer has been incredibly challenging for me. It’s one thing to know the rules and quite another to know how to apply them. How depends on climate. Mechanics of Paint Lifting. Paint failure due to moisture is quite simple really. Moisture finds a way behind the paint to the wood or drywall underneath. It combines with tannins, wood sugars, or salts, which bleed to the surface. Paint doesn’t bond to these contaminants (surfactants) well. Presto! The paint lifts off. Water vapor moves only moves by vapor diffusion and air transport. Understanding these too ways, and knowing what climate zone the house is in, leads to lasting solutions. Vapor diffusion is the movement of moisture through a material as a result of a pressure difference (wet->dry) or thermal difference (hot->cold). It will go right through drywall, concrete, etc. Vapor flowing through a hole in a material is air transport. Stopping air transport is easy: close the hole. Vapor diffusion control is a lot harder to understand, but it’s a heavy contributor to wrecking paint jobs. Acknowledge moisture cannot be complete kept out of a house for all time and under all conditions. Following these rules will allow a building to work fine and last a long time. Ever wonder why there are so few antebellum homes left? Moisture got ‘em! Following these rules is hard because methods used to keep moisture out won’t let it out when it gets in! Ventilation. A lot of moisture moved out of older houses through air transport until we started air sealing them. Then, they started acting like terrariums. We were all shocked to find out how much water vapor we produce just by living in our house! To let interior moisture out, mechanical ventilation is needed. Use bath area and rangehood fans. However, when the house is tight enough (below 1 air change every 3 hours), 24×7 ventilation needs be considered. What’s ventilation got to do with it? Water vapor will go straight through the drywall and into the wall cavities on exterior walls. In the meantime, it makes insulation soggy, rots wood, lifts paint off siding and blisters paint on drywall—all while trying to dry out! Ventilation is key for moving water vapor in the house, attic, and crawlspace. The best resource I know about moisture management and how it relates to paint is the Builders Guide to Mixed-Humid Climates. The Energy & Environment Building Association (EEBA) has a builders guide appropriate for your environment. However, the book is about how to put the whole house together with indoor air quality, moisture control, and energy transfer in mind to deliver a healthy, long-lasting, comfortable, and energy-efficient house. The index is worthless, but reading the entire book is extremely helpful and teaches you how to apply the principles to your house. It’s a great inspiration for this blog! Contact us or a local home performance professional to answer your questions. Here, we covered the laws and axioms of water vapor and how it relates to paint peeling. In the second, next, and final post on this topic, we talk about how wall construction needs to conform to the laws of water vapor to avoid peeling paint.